EARLY IN THE AFTERNOON THEY REACHED THE SEA AND WILL knew he was near the end of his journey. Castle Seacliff was set on a large, leaf-shaped island, separated from the mainland by a hundred meters of deep water. At low tide a narrow causeway allowed access to the island, but at high tide, as it was now, a ferry provided transport across. The difficult access had helped keep Seacliff secure for many years and was one of the reasons why the fief had become something of a backwater. In earlier times, of course, the raiding Skandians in their wolfships had made things quite lively. But it had been some years now since the sea wolves from the north had raided the coast of Araluen. The island was perhaps twelve kilometers in length and eight across, and Will could not yet see the castle itself. He assumed it would be set somewhere in the high ground toward the middle—that was basic strategic thinking. For the moment, however, it was hidden from sight. Will had debated stopping for a meal at noon, but now, so close to the end of his journey, he decided to press on. There would be an inn of some kind in the village that would huddle close to the castle walls. Or he might find a meal in the castle kitchens. He tugged the lead rein to bring the packhorse alongside and leaned over to inspect the wounded dog. Her eyes were closed and her nose rested on her front paws. He could see the black sides moving in and out as she breathed. There was a little more blood around the lips of the wound but the main flow had been stanched. Satisfied that she was comfortable, Will touched a heel to Tug's side and they moved on down to the ferry, a large, flat-bottomed punt that was drawn up on the beach. The operator, a heavily muscled man of about forty, was sprawled on the deck of his craft, sleeping in the warm autumn sunshine. He awoke, however, as some sixth sense registered the slight jingle of harness from the two horses. He sat up, rubbed his eyes, then came quickly to his feet. "I need to get across to the island," Will told him, and the man saluted clumsily. "Yes indeed, sir. Of course. At your service, Ranger." There was a hint of nervousness in his voice. Will sighed inwardly. He was still unused to the thought that people were wary of Rangers—even one as fresh-faced as he was. He was a naturally friendly young man and he often longed for easy companionship with other people. But that was not the Rangers' way. It served their purpose to remain aloof from ordinary people. There was an air of mystery about the Ranger Corps. Their legendary skill with their weapons, their ability to move about unseen and the secretive nature of their organization all added to their mystique. The boatman heaved on the thick cable that ran from the mainland to the island, passing through large pulleys set at either end of the punt. The punt, afloat at one end, moved easily from the beach until it rested wholly in the water. Will guessed that the pulley arrangements gave the operator a mechanical advantage that allowed him to move the large craft so easily. There was a tariff board nailed to the railing and the operator saw him study it. "No charge for a Ranger, sir. Free passage for you." Will shook his head. Halt had impressed on him the need to pay his way. Be beholden to no one, he had said. Make sure you owe nobody any favors. He calculated quickly. Half a royal per person, and the same for each horse. Plus four pennigs for other animals. Close enough to two royals all told. He swung down from the saddle, took a gold three-royal piece from his purse and handed it to the man. 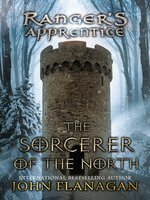 braydencreekside - This was a great book, where Will has to get away from castle Macindaw with it's King, when the kings father is killed by a disease. Will goes deep into the evil forest to seek help from an evil sorcerer, but is he really evil. This was a great book that I loved.